The tour's designated meeting place was Pescadores Restaurant (pescadores means fishermen in Spanish) at the corner of Letre Road and Dagat-dagatan Avenue, where a hearty lunch was served gratis to all guests. Notable of the food served were the unique patis-flavored adobo (usual adobo recipes use toyo (soy sauce) and not patis (fish sauce)) and Pancit Malabon, the eponymous comfort food of the city closely related to pancit luglug and pancit palabok. After a brief introduction, the group was arranged into more manageable groupings and proceeded in convoy to our destination. On passing the bridge, Tutubi was able to snap a photo of Asilo de Huérfanos (Asylum of Orphans) made of adobe. It was at Asilo de Huerfanos where the newspaper of the Philippine Revolution and subsequently of the Philippine-American War, the Antonio Luna-guided La Independencia, was said to be first printed as displayed on the newspaper's masthead. (In reality, this was just to mislead the Spanish authorities, the printing press was located in a clandestine location in Manila, the same printing press of the earlier La Libertad (Kalayaan) paper ordered closed by Gen. Emilio Aguinaldo). 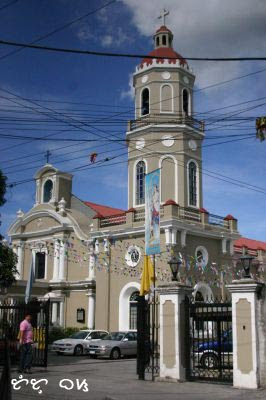 The group first visited the San Bartolome church with its Greek-style columns and saw the ghastly renovations being done that practically erased the original features of the heritage church. Across the street is Betsy's Cake House to have a taste of their broas, soft and delicious unique to malabon though quite pricey (for the penny-pinching Tutubi) at P17.50 a piece. The works of a contemporary of Fernando Amorsolo (a Philippine National Artist in painting), silent artist Serafin Serna, were on display with his conservative style of painting. After a short pilgrimage to Concepcion Church, with it's large ceiling paintings, a tour of old heritage houses ensued, first with the Dionisio house (still beautiful but unoccupied), the beautifully preserved Borja House, the sinking Gonzales House that features adaptive re-use of floodwater turned into a lagoon teeming with fish, and three Luna houses, one of which has a ceiling painting by Fernando Amorsolo. 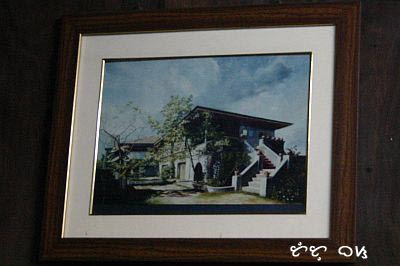 (The group weren't able to enter the house where Amorsolo's painting is present due to the owner's request not to be disturbed owing to a recent stroke). Nearby is also Dolor's Kakanin famous for their sapin-sapin. 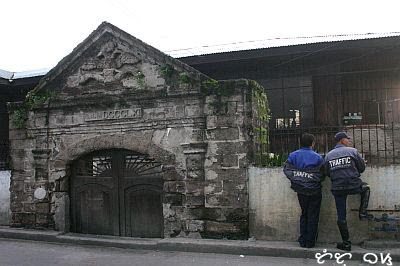 Old Spanish heritage houses of Malabon, like typical bahay na bato (stone houses) architecture, are usually two-storey structures. The ground floor is made up of brick stones or adobe while the second floor made of wood. Use of capiz (a kind of mother of pearl) on large windows to allow light to enter the room (Capiz is to the Philippines; Paper is to the Japanese) aided by high ceilings, ventanillas (small windows) or wood balusters permit efficient air circulation and ventilation suited for the tropical climate of the Philippines. The floorings on the first floor are usually made of piedra china (Chinese granite) and the wooden, balustered stairs usually narra or mulawin. Walls and ceilings are mostly made of wood adorned with highly detailed designs reminiscent of a genteel bygone era. A detour at Angel Cacnio house and gallery, housing various works of art by Angel Cacnio and his son Ferdie Cacnio, later spiced by an inside look at the famous Rufina Patis Factory introduced the guests to the hidden gems of the city. A visit to the Martinez house, a short walk from Rufina Patis Factory where the guests were treated to a feast of Malabon specialties: pancit malabon, sumpia (how people of Malabon call their fried lumpia), puto sulot (a uniquely Malabon dessert made of glutinous rice), bibingka (rice cake that Tutubi found to taste better than Ferino's bibingka), puto bumbong (violet-colored glutinous rice steam-cooked in bamboo tubes served with grated coconuts and margarine), pichi-pichi (yellow, translucent, steamed grated cassava (or cassava flour) served with grated coconuts), kikiam (que-kiam), and tamarind-looking camachile biscuits. 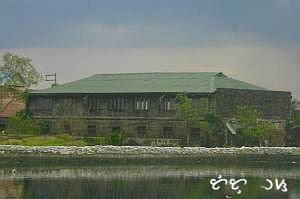 After the Patis saga, an encounter with the oldest existing house in Malabon, the 1861 semi-submerged Raymundo house on the banks of Malabon River, which in reality used to be a strait separating the islands of Malabon and Navotas before a man-made activity that changed the geomorphology of the place, called reclamation, took place. The last stop of the tour was at Bahay Parokyano an art gallery catering to Malabon's grassroots artists. 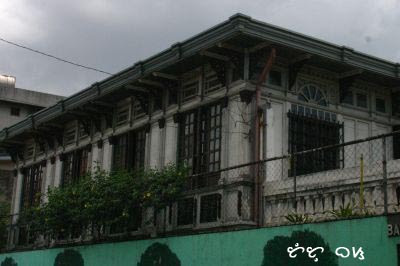 Malabon has indeed many heritage houses needed to be preserved for posterity, various food unique to the city and historical sites that need to be promoted. It's such a shame the local government hasn't been promoting their city to the full potential and do away with the "mala-venice sa baha" image. Tutubi and his friends extend their gratitude to the organizers of this event: Richard, Monchet et al. 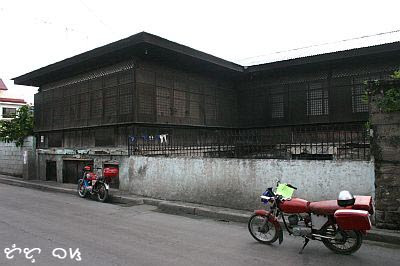 For more pictures of Malabon, you may visit Richard's Multiply site. Commute: In Monumento, accessible to buses on EDSA, or LRT Monumento station, there are jeepneys plying Malabon via Letre road to take you to the city proper and also pass by Pescadores Restaurant. driving directions by car from EDSA going to Monumento, take Samson Road and go straight until you see the fork on the road (Letre Road), you'll see Pescadores Restaurant on the left. those are lovely, lovely spanish houses. my lola's house is also one sans the year on the gate. in paris, the houses/apartments also have the years posted on their gates and dating from the 1800's as well. Looks like a pretty special place. It's good that these houses were preserved and left the way they were build. Our older buildings which were updated or remodeled to a modern look has lost its originality. sana sumama 'ko. may mga points of interest pala sa lugar na yan. did you get the history of pancit malabon? First time I've heard of patis-flavored adobo. 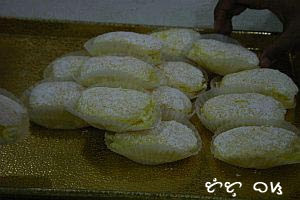 Which one do you prefer - cooked in patis or toyo? nice post... wheewww malapit lang sa amin yan... i stayed in sangandaan, kalookan for 8 years before moving to qc on 1999.
i have friends and classmates (in UE-Kal)from malabon... i experienced walking in the streets of malabon during rainy seasons wheeeeww... i've been there also in concepcion. nang may pwesto ang cousin ko sa palengke ng sangandaan, we used to go to malabon 2am, sa bagsakan ng mga isda. niceheart, the adobo sa patis is good but i still prefer the toyo one. i grew up with it, mybe that's why. 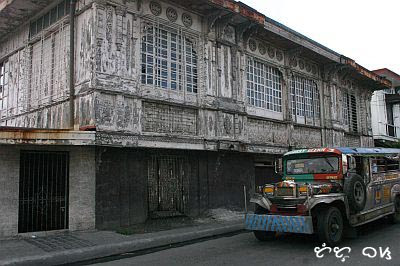 Didn't know there are interesting old houses in Malabon, too! 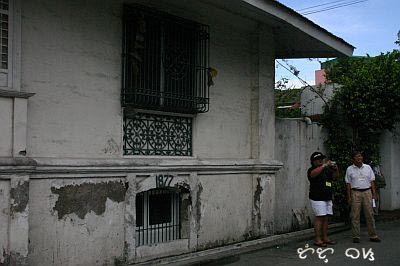 Pumunta pa ako ng Taal town to see old houses, meron naman pala sa malapit lang. But of course, I wouldn't be able to make the tour by myself alone. Kaya dapat makakasama ako sa mga guided tours. by the way, if you're back to betsy's again, you should also try their burger. one of my faves. and if you're going to the public market sa bayan, ask for vergel's tapang kabayo. yum! This is the daughter of Betsy. You are welcome to Betsy's anytime, sans budget. Please let us know when you are planning this impromptu visit to Malabon. We will be more than happy to provide more paintings of Papa's works and his sketches. I also would like to commend Atty. Monchet Lucas for organizing this trip with Terry. I live in Malabon, but only now, have these glorious houses have been opened for viewing. Art and Food. What could be better? bessiebride, i definitely will re-visit probably in summer. Monchet's initiative isreally worthy of emulating.kudos to them organizers with pride of place! sana napuntahan din ninyo yung tugatog cemetery, where the (in)famous statue depicting the triumph of a devil over the archangel michael (or miguel)will be found, the malabon zoo, the famous store of dolor's kakanin, sunset at the palaisdaan (fishponds). i grew up there, and you should be back during the flood season. and also, you should check out a barangay in panghulo, wherein the people have managed to live to aged old floodwaters that didn't go away. I live in Malabon all my life (51 years). Even with floods, people here will still stay or keep their houses. There is something about Malabon that people here can't leave the town for good. If people here decides to leave the town, it is more likely a migration to other country. Most people here are related through marriages. My paternal grandmother (Agrifina), the owner of Borja House (Manuel), the paternal grandmother (Basilisa) of Judy Ann Santos' father and Dr. Mauro Borja (whom a street in Malabon was named after) are siblings. 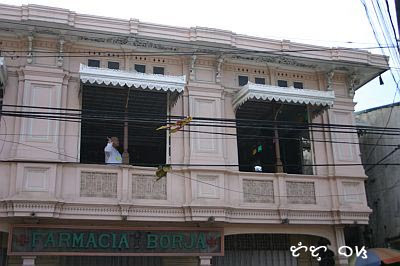 Two daughters of Manuel Borja were married to a Luna and a Gonzales who are also owners of old houses. The only son of Manuel Borja (Dr. Alberto Borja) is married to a daughter of Mr. Ildefonso Santos, who is a very well known Filipino writer and author (Remember "Diwang Kayumanggi"?). His colleage, Mr. Rufino Alejandro, also a well known writer, lived right next to our house along Naval St. in barrio Flores. My mother (Lydia) is a cousin to Betsy's mother (Tiya Bella)... After having said the above facts, it's also the people in Malabon and not just the foods that we adore our place. everytime I pass by the place...i feel the past when it stood so mighty elegant before the eyes of its happy owners..nice to have you featured it...there are a lot more who seemed to be left vacant by its owners..gone perhaps? or left because its always flooded...wheeewww, how agonizing to see these old houses submerged in floodwaters..or left leg-deep or waist deep below the upgraded roads. please explore some more. Mayor Tito Oreta must be informed about this and his Tourism dept must have at least an organized tour. We do have a lot of things to be proud of. Am proud to be a product of St. James Academy...the one and only co-ed school run by Maryknoll sisters. And did you know that the Arellano University in Manila is now chaired by Francisco (Koko) Cayco... SJA batch '70 or '71? By the way, I still am residing here in Malabon. Hi tutubi! This is very informative and it made me want to visit Malabon when we go home. My family is from marikina but I've lived most of my life in baguio. I am very interested in 'bahay na bato' houses (good pictures by the way) and food so I've listed the 'to visit in malabon places' down like Pescadors and Betsy's. Can you recommend a good, easy on the budget accommodations in the area? im also a product of malabon from a big clan of cruz family i hope that the local government gives respect and valued the historical sites,the great heritage,and introduce it to many schools to educate the young one about thier roots and helps the people of malabon promotes their crafts and deliciuos food thanks to richard and his friends.. God Bless!! "Proud to be Malabonians". pano po bang pumunta ng Brgy. Panghulo Malabon? kung galing ng Pasay? i also grew up in malabon, gone for a while, but came back here. i could say there's nothing place like home. how i miss the malabon especially the foods: pancit malabon, kakanin, rellenong bangus, turon, kare-kare,binatog, tatampal, puto sulot at bumbong, bibingka, etc.. i also missed the floods. how happy i am to know that during the time of typhoon ondoy, the floods in malabon is not so deep as compare to other city (but i'm very very sad for other city during that time). Usok ng kapaligiran ng lechon ng mga taga Hulo. hanggang sa pinalitang Gregorio Sanciangco o Arellano. tagal sa pagkabata sa kinagisnang lugar na Flores at Hulo. Di kita kailan man malilimutan. lagi kang laman ng busog kong tiyan. sa malamig mong sorbetes sa harap ng Farmacia Moderna. sa kalikasang dating sa inuman sa Balsa. o sa pagsalo-salo sa pagkaing serbisyo ng Mary Jays kusina. na laging pinakikinggan ng abang lingkod ninyo. hanggang sa katakamtakam na kikiam ni Mang Jose. At sarap ng luto ni Lola Eced ay wala ka nang hahanapin pa! Fishfond Restaurant na ngayo'y Pescadores. Bota para makapaglakwatsa o maghintay ng kati ng ilog para makalayas. bumili na at isawsaw natin sa kape.